Barry Gower has been in private practice since 1998 as a Sexual and Relationship psychotherapist and is also a supervisor, working in person and online. He has worked in a variety of places and is currently in Crystal Palace, South London. After initial counselling courses at the Gestalt Centre and City University, Barry trained at the Whittington Hospital School of Counselling and Psychotherapy, with a PG Dip in Psychosexual and Relationship Therapy, an Advanced Diploma in Psychotherapy, and a PG Diploma in Supervision ad Consultancy, plus MSc in Psychosexual Therapy from South Bank University. He is registered with UKCP (United Kingdom Council for Psychotherapy) and accredited as a Psychosexual and Relationship Therapist by COSRT (College of Sexual and Relationship Therapists). He is also accredited as a supervisor by COSRT and on the UKCP/CSRP (College for Sexual and Relationship Psychotherapy) directory of approved supervisors. 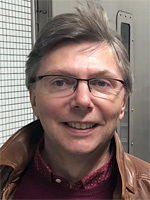 Barry was awarded Fellowship with COSRT in 2017. Barry has been a member of the Executive of CSRP since 2014, being Chair of the CSRP Ethics Committee, and was Hon Secretary of CSRP 2015-2016. He was on the COSRT Ethics Committee from 1998 to 2015, being Chair of the Committee 2006 -2015. He served on COSRT's Professional Standards Board 2006-2015. Before training in counselling and psychotherapy, Barry obtained a BA (Hons) in Politics and Modern History from Manchester University and was admitted as a solicitor, practicing for some years, before going to work in the voluntary sector where he was director of two organizations, including a local MIND.